A press conference was held on Tuesday, the 11th of March in which Syedna Qutbuddin’s shehzadas Dr. Abdeali bhaisaheb and Dr. Aziz bhaisaheb invited members of the media to ‘share the plans of 53rd Dai al-Mutlaq Syedna Khuzaima Qutbuddin’. The conference was originally organized at the Trident hotel in Mumbai. On the night of the conference the organizers received a call from the hotel saying that they were canceling the booking and were no longer prepared to hold the conference. The manner in which the hotel cancelled left little doubt as to what had precipitated this sudden change. They were not prepared to discuss the matter further and that was that. Attempts to book a venue in other hotels met with a similar response. Whoever was motivating or intimidating was doing so with the purpose to stop this press conference. The next morning, only a couple of hours before the conference was scheduled, the organizers managed to reschedule to a new venue, the Trade Centre in Bandra, Mumbai. Despite the last minute change of venue, the majority of the journalists who had confirmed attended. The conference began with a short opening statement giving a background to the events taking place in the Bohra Community following the sad demise of our beloved AqaMaula Syedna Mohammed Burhanuddin RA. This was followed by an hour and a half question and answer session that was characterized by hard hitting questions and a lively discussion. 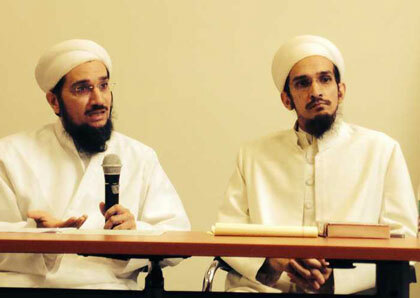 Dr. Abdeali bhaisaheb added that “Now that the period of mourning is over, in this time of confusion where a false claim has been made by the Shehzadas, it is time to come forward to tell the truth publicly…On June 4, 2011, three days after Syedna was admitted to the hospital, they unilaterally made the false claim that Syedna Burhanuddin Saheb in that condition called his three other sons and loudly and repeatedly proclaimed his second son as his successor. We know this is a false claim and have adequate materials to show that this was not medically possible. These materials will be presented in the right forum and will expose their untruths”. News of the conference was carried by most of the major newspapers. The press release issued at the conference is available in the press section of fatemidawat.com. The articles published by the media are also available on the Fatemi Dawat Facebook page.